It’s a four-hour drive from Seattle to Cannon Beach, Oregon, and we had a full schedule for our first day. So, much to Michael’s liking, we were on the road by 6 AM. Don’t worry – grumpy wife caught up on her sleep during the drive. As we drove into town, a stretch of the legs seemed like a good idea. So we pulled into Ecola State Park to hike the Clatsop Loop. The Loop is listed as 2.5 to 3 miles long. For hikers (like me) who really don’t appreciate a hike that starts out with a mile of solid, constant, and steep climb, it is totally worth it! Once you reach the top of the climb, you loop around to the bluff over the ocean. For an aerial view GPS track check here. 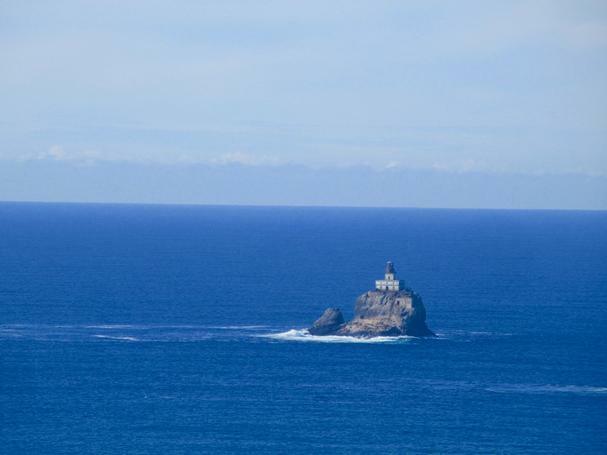 The views were amazing – especially of the Tillamook Rock Lighthouse. Built in 1881 the lighthouse earned the nickname “Terrible Tilly” because of the erratic and difficult weather conditions and the dangerous commute for keepers and suppliers. It was decommissioned in 1947 and sold to private owners. After changing hands a few times, a group of realtors bought it and opened the “Eternity at Sea Columbarium.” After interring 30 urns of cremated remains, the columbarium’s license was revoked by the Oregon Mortuary and Cemetery Board. A reapplication in 2005 was also rejected. It seems to be an isolated place for a loved one’s remains, but they share the final resting place of many whose ships crashed at the sight before the lighthouse was lit. The Clatsop Loop is just one of many hikes in the park and nearby Tillamook Head. You can check out these hikes. For more adventurous and experienced hikers, the Oregon Coast Trail goes through Ecola State Park. Not for the faint of heart – this is 382 miles that go from the Columbia River at the northern border of Oregon to the California border. If you are going to hike this, be sure to plan according to the tide tables, as much of the hike is along the beaches. There are also portions of the hike along the shoulder of Hwy 101, and through some small towns along the way. Our next task was to check into our home for this trip – the Hallmark Resort & Spa at Cannon Beach. The beachfront resort is located at the south end of town, just steps away from the famous Haystack Rock (pictured above). You will also find a full luxury spa, 2 indoor saltwater pools, fitness room and free cruiser bike (also known as fat bikes) to enjoy a bike ride on the sand. If biking on the sand sounds good, check out the Fat Bike Festival next May. Three fun-filled days of sunset beach rides, bonfires, games, and activities. With our beautiful ocean view room, we thought it would be a great place to “storm watch.” The Oregon Coast has had some record-breaking storms, such as the Columbus Day storm of 1962. A weather station just north of Cannon Beach recorded 170 mph winds. Of course, everyone knows that summer is ideal on the coast, with over 15 hours of daylight vs. 8 in winter, and less than 0.50 of rain in July vs. 11 inches in November. Still – those storms can be pretty good viewing, from a cozy hotel with your fireplace lit. The fall and winter seasons also have lots to offer, food, hikes, walks on a breezy beach and an ocean view room at a discount! And sometimes you hit the jackpot! While we were there in November, the temperature hovered around 60, and the skies were bright blue. 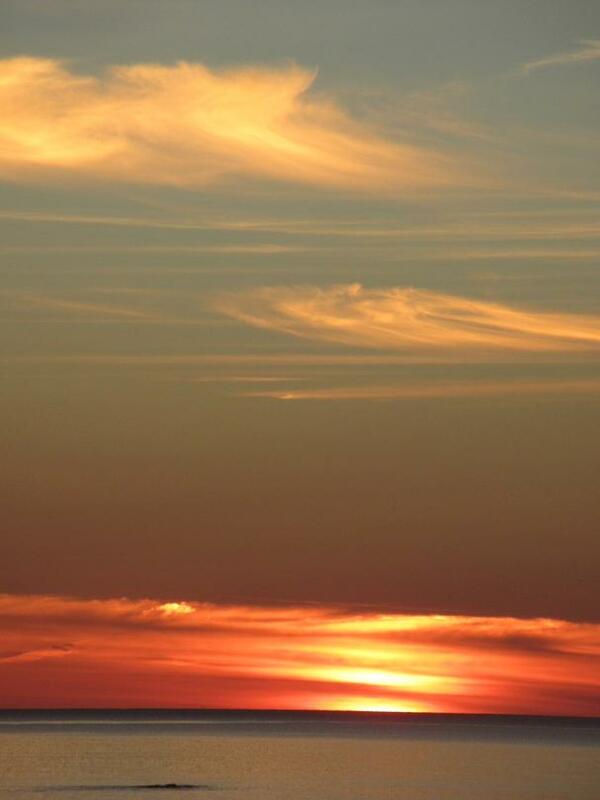 And, any part of the year, you will see stunning sunsets and sunrises. For our first dinner in Cannon Beach we walked a short distance to Newmans at 988. The restaurant features French/Italian cuisine and has recently celebrated its 10th anniversary. Chef and owner John Newman is known as an “Oregon Culinary Rock Star” and has an impressive resume. He trained in New York and has worked in major cities in the US and Europe. He has also cooked many times for the James Beard House in New York City. 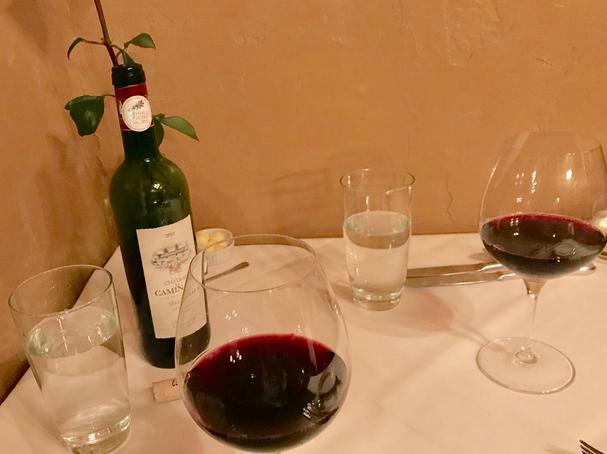 We began our dining experience with the Cahors La Commander Malbec from French vineyard of Chateau La Caminade. The wine had a beautiful deep red color and the aromas of red fruits. The tastes notes of black currant, blackberry, and cherry were carefully balanced with very mild tannin. For appetizers, we chose the Soup Du Jour, a tomato soup rich with the taste of oregano, and their signature Crab Cakes. 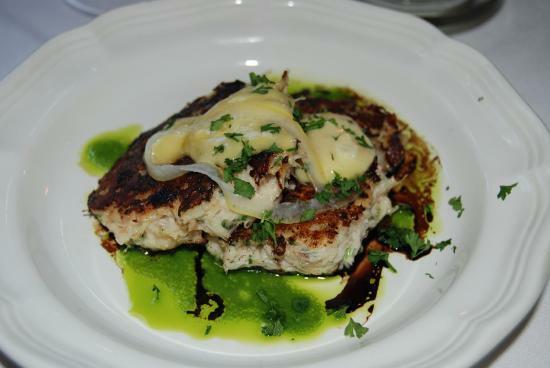 The cakes are made with parsley, lemon, loads of delicious fresh tasting crab, and served with a shallot aioli - probably the best Crab Cakes I’ve ever had. We also shared the Grilled Romaine Salad served with pancetta, parmesan, and candied nuts. The romaine had a lightly charred flavor, set off perfectly by the candied nuts. For our main dishes, I had the Duck Breast with braised greens, foie gras, with a truffle oil drizzle. I love duck but have found that the quality and taste can vary greatly. This dish was one of the stellar examples! Michael ordered Marinated Lamb Rack, with mushrooms, potatoes, and a natural reduction sauce. The lamb was cooked to perfection and very tasty. When asked about dessert, we both responded that we were too full. But there is just something about the word ‘gelato’ that can change your mind about that. Michael’s peach gelato had a clean peach taste and was very refreshing. I had vanilla with hot fudge. Very yummy. The next morning, on our way to Oswald State Park, we discovered the Sea Level Bakery. If you’re up for some exercise before indulging in goodies, you can walk to the bakery, about 15 minutes along the beach (best during low tide) from the Hallmark to Delta Street. One short block from the beach is the Sea Level Bakery. The bakery is typical of the restaurants and shops in Cannon Beach, all small businesses, often family-run. Owners Jason and Liz Menke met in France and got married in Lincoln City, OR. Liz was working in France with a church group, and Jason was helping his French grandparents. They both ended up at a surfer’s conference in France where they met. Both were born and grew up in the Pacific Northwest and had to travel to France to meet! The bakery shelves were weighed down with scones, biscuits, loaves of a great variety of breads, pies, sticky buns and just about anything else you can think of. Liz is in charge of the bakery part of the business and is mainly self-taught. Her banana bread is from an old secret family recipe and is delicious. Jason takes care of the coffee end of the company. He is also self-taught, honing his skills with some roasting at home. Today they use beans roasted at Portland’s Heart Coffees. The coffee bar offers all the traditional fare, for a pure, rich coffee experience try one of their weekly pour-over selections. When not at the bakery Jason gets some surfing in and his teaching his three daughters the art of surfing. 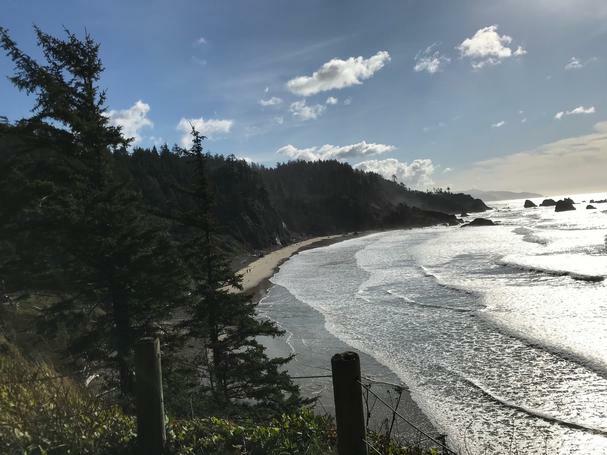 Continuing our journey to Oswald West State Park, we drove a short 10 minutes south to this fantastic 4-mile expanse of coastline bordered by old growth forest. The park stretches from Arch Cape to Neah-Kah-Nie Mountain. Along with a secluded sandy beach, the 2,484 care park includes miles of trails, leading through the dense forest, providing breathtaking views of the Pacific Ocean. 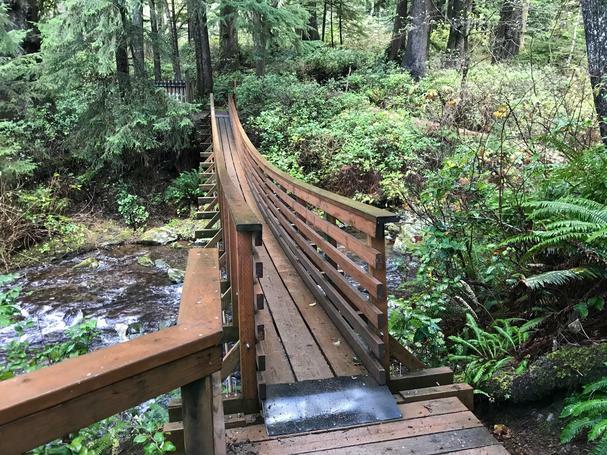 From the south parking lot, you will find a short hike, the Necarney Creek Trail which connects with the Cedar Crossing and Old Growth Trail. In all there are 14 trails within the park to choose from. The park is also traversed by the Oregon Coast Trail. Salty ocean breezes, beautiful views, a bit of exercise – for us that adds up to a sudden need for a good cold brew. Luckily there are some excellent brew pubs in Cannon Beach. During our two day stay, we tried out two of them. The Pelican Brewing Company was the first. 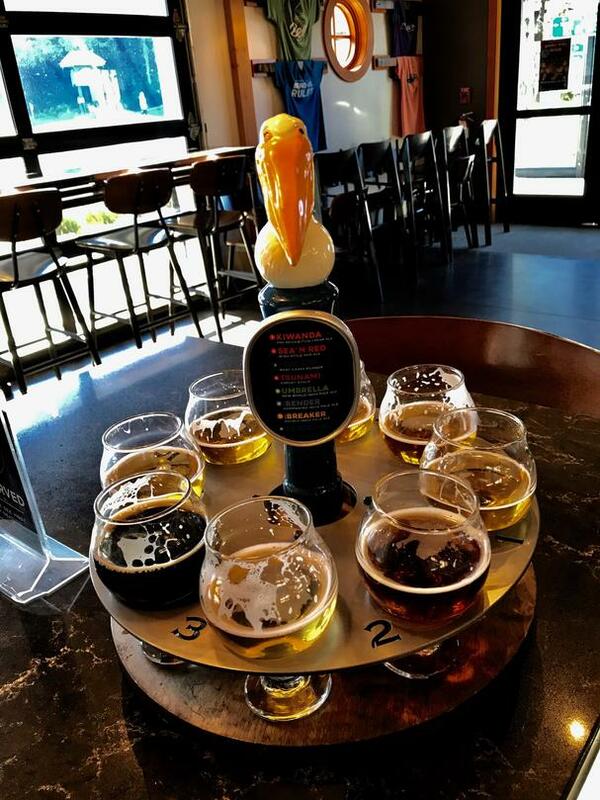 Brewmaster and co-owner Darron Welch came onto the scene in 1996 when he joined forces with Mary Jones and Jeff Schons who were hatching a plan to open Oregon’s first beachside brewpub in Pacific City OR. 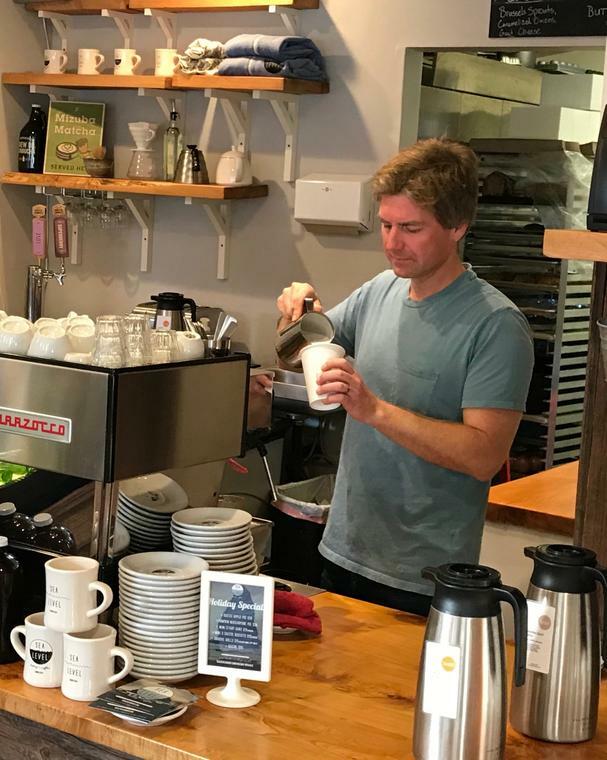 Along with the newest addition in Cannon Beach, they currently operate at the original Pacific City location along with a third in Tillamook, Oregon. Their tag-line “Born at the Beach” makes perfect sense. In just 2 decades they’ve become a known leader in the craft beer industry. And have won over 300 awards, many of them international! At Pelican, even though it’s all about the beer, it’s also all about the food! 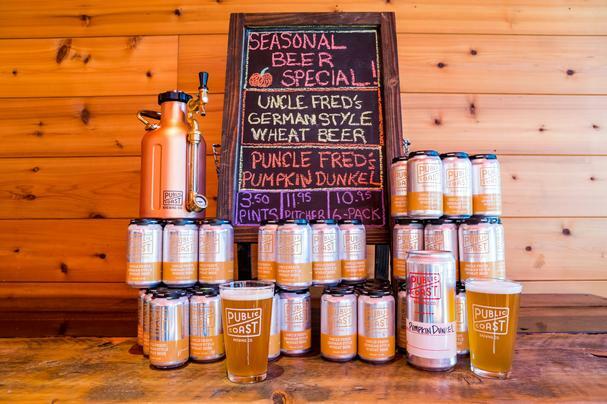 Their menu has beer pairings with every selection, and many of their recipes include beer as an ingredient. 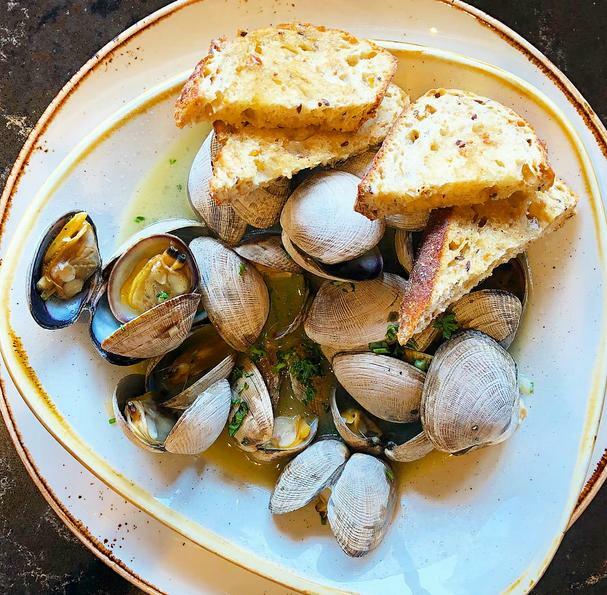 We started our lunch with a pound of local Steamer Clams steamed in Kiwanda Cream Ale, with fresh herbs and served with a generous portion of crispy grilled bread, the Northwest Clams were delightful. Menu notes recommend pairing with the Kiwanda Cream Ale, which is crafted in a pre-prohibition style. We also had to try their award-winning clam chowder. I can understand why it is award-winning – light on the cream and chock full of clams. It is recommended to pair it with the Tsunami Stout. For his entrée, Michael had the Oregon Wild Caught Lox Flatbread. 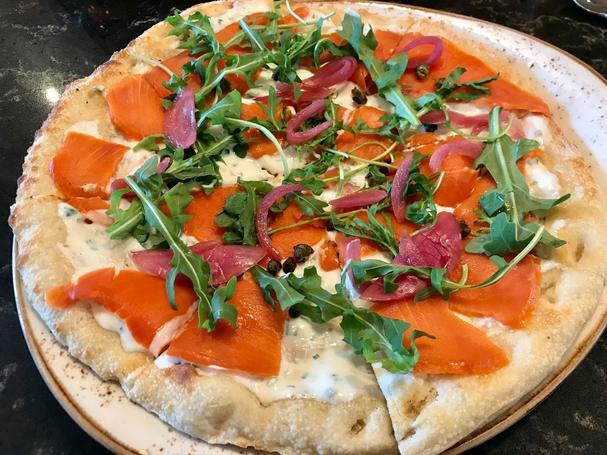 The flatbread is made in-house and is topped with fresh lemon-chive crème fraiche, lox salmon, organic arugula, fried capers, and house-pickled onions. Pair it with the Umbrella IPA. Michael would share only a small (tiny) bite, but it sure was good. I wanted to try a burger, so I ordered the Roasted Pepper and Blue Burger, which was served on a spent grain bun. I had never heard of spent grain, but it fits in well with the reuse-repair-recycle philosophy. At the end of the brewing process, there are pounds of “spent” grains left over. Brewers used to compost it, use it as animal feed, or just throw it away, but many trend setters have found a delicious way to use it in baked goods. The hamburger bun was delicious, and as an added bonus, it turns out that as little as 5% spent grain in the dough doubles the fiber content, increases the protein by as much as 88% and decreases the carbs and calories! In between the bun was an all-natural Oregon grown beef patty which was served with a red pepper sauce and a creamy bleu cheese spread. Regular readers may have noticed that any time I have a great hamburger, I’m likely to deem it the “best I’ve ever had” – but really, this one was the best! The menu recommended a pairing of Sea’N Red Ale – but I broke protocol and had the Umbrella IPA (ABV: 7.4%, IBU 60). Dry hopped using Australian Ella hops, the Umbrella has a distinct and complex malt character and aromas of kiwi and passionfruit. Even Michael (not a huge IPA fan such as myself) loved the Umbrella! The next brewery we visited was on the other side of the downtown area, Public Coast Brewing. In 1967 Oregon passed a landmark bill making all 363 miles of coastline open and free to all. Although I’m sure that this happened well before owner Ryan Snyder was born, as a true beach lover, he felt it was definitely worth celebrating this law! Ryan was living in Las Vegas and running the taps in the Holy Cow Brewery. He met “the girl from Cannon Beach” and moved north to join the family business. One of the properties owned by his in-laws was Clark’s Restaurant, where he became the manager. Having become enamored of beer back in his Vegas days, he determined that Clark’s was a great location for a brewery. The chef of Clark’s at this time was Will Leroux. Together they decided to make his dream a reality. Only one problem, neither of them knew anything about brewing beer! So Will started on a crash course in the craft, including moving to Las Vegas for a time to learn from the head brewer at Holy Cow (now known as Big Dog’s Brewing.) Back home, Ryan consulted with Fred Bowman, founder of Portland Brewing for advice on all aspects of running a successful brewery. 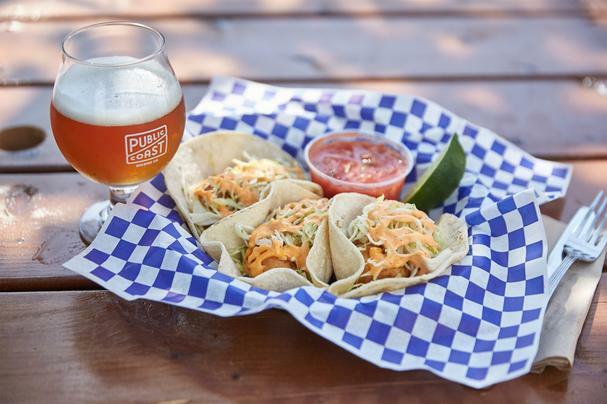 Pubic Coast Brewery opened its’ doors in May of 2016 and has grown full steam since. One of their first beers was the ’67 Blonde Ale (remember the 1967 law?) Two years later the ’67 Blonde won a gold medal at the Oregon Beer Awards, and shortly after that a gold in the American Golden or Blonde Ale division of the World Beer Cup! So, of course, we had to try that one! Blondes are brewed to be easy drinking and accessible. This one is a favorite of the regulars. It is crisp and clean, with a slight hop presence. Leroux brews this on with Saaz hops, creating a hoppy character without overwhelming the taste. Also enjoyable was the Oswald IPA, named after Governor Oswald West who first tried to pass the Oregon Beach Bill in 1913, but was unable to get it passed. It wasn’t until ’67 that another governor (Tom McCall) was able to push the bill through. Public Coast’s website describes the Oswald by comparing it to politicians, with a “familiar bitter bite.” For IPA lovers, that is a great endorsement! With 74 IBU the hops come through brilliantly. Of course, you need a great burger to go with a great beer! The burgers at Public Coast are made with grass-fed, local, and organic beef. Their commitment to local sourcing is evident on the menu, with many of the items identified by the farm or ranch from where they came. All of the fish they serve is fresh and locally caught. Plus – just about any of their menu items can be prepared gluten-free – even the fried food! Wow – gluten-free onion rings! Brand new on the menu is Stephen’s Root Beer, created and brewed by head brewer Lou and his young assistant Stephen – Ryan’s 13-year-old son. Keepin’ it in the family! Someone once mentioned, “you know, it’s not always all about the beer.” So we headed for the Cannon Beach Distillery to explore some differently spirited beverages. 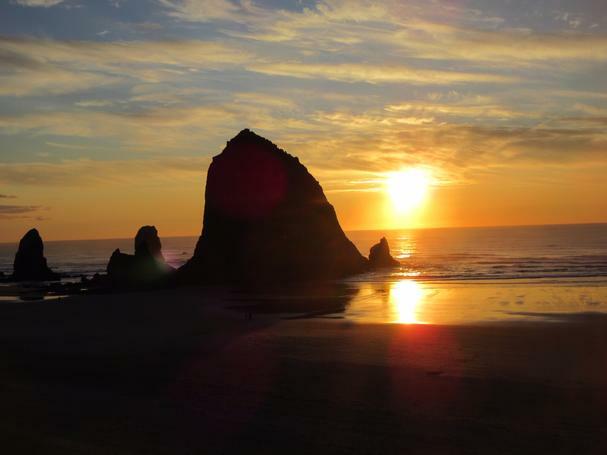 The town of Cannon Beach gets its name from a tragedy in 1846 when the USS Shark was shipwrecked off of nearby Arch Cape. One result of the shipwreck were many cannon balls (officially called carronades) that began washing up on the shore. 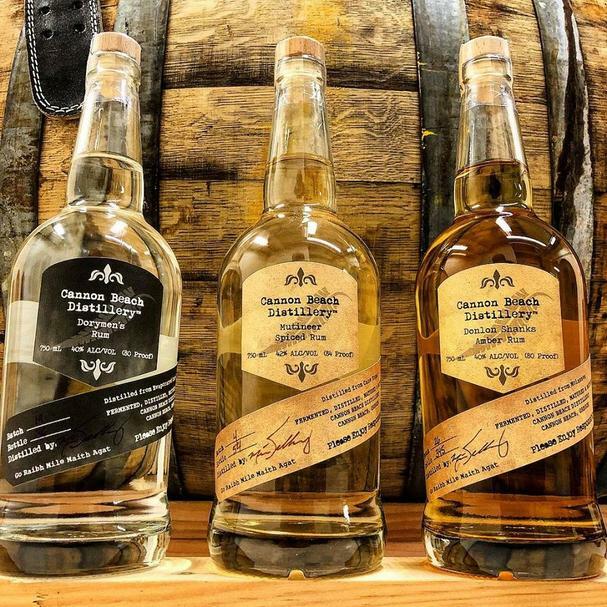 Owner Mike Selberg honors this history by designating his small-batch whiskey releases as the Carronades Collection. Each batch is distinctly different and is so small that it usually sells out quickly, and is sold only out of the tasting room. But whiskey is just one of the spirits that CBD produces. CBD first opened in 2012 by owner and distiller Mike Selberg. Mike was born in Portland and grew up in the Pacific Northwest. A few days after his high school graduation, he headed out to Cannon Beach to make it his permanent home. After studying a number of disciplines (music, psychology, and art history), he finally ended up in the Natural Sciences. His focus on biology and chemistry directly led to his calling as a distiller. Today he makes tiny batches of just about every category of distilled spirits: whiskey, rum, gin, and a “tequila-like” spirit made from agave. The use of the name tequila is restricted to just two states in Mexico. But while the ingredients in Mike’s two agave offerings (Il Keyote and Xalapa Agave Spirits with Jalapeno) are the same, but his technique is closer to the process of making brandy. This results in a couple of very drinkable spirits. My favorite was the Xalapa. It is un-aged and distilled over a fresh deseeded jalapenos. The spicy taste of peppers is found in the capsaicin of the seeds, so this is not a spicy drink. Instead, you get a very unique smell, and subtle taste of jalapeno without the “burn.” The notes of fresh green jalapeno coordinate beautifully with the white pepper characteristic of unaged agave spirits. Michael preferred the complex and spicy structure of the Mutineer Spiced Rum. Mike starts with a base of his award-winning Dorymen’s silver rum, and during the distilling process he adds a whole parade of sarsaparilla, birch, spearmint, orange peel, licorice root, clove, and a few other botanicals. It is then aged on a bed of sassafras sticks. The result is a rum with a multi-layer and intricate structure. I usually prefer my rum in a cup of eggnog, but this one is too delicious to get in its way. We both thoroughly enjoyed Sweet Virginia’s Oregon Straight Bourbon. It offers the surprising experience of being bold and rich up front, before melting to a delicate, smooth finish. The trick is to balance the big flavors of the grains, and the time spent in the oak cask, giving it a warm butterscotch taste note. Distillers have a unique relationship with their stills. Most distilleries we’ve visited have named their still, and consider it almost like a member of the staff. Mike’s still is named Bernie, after his grandfather and Sweet Virginia’s Oregon Straight Bourbon is named after his mom, Gigi. While Mike started out as a one-man-show, he credits his family and friends for all of the support he’s received. All of this support, and Mike’s talent and hard work has sure paid off. The Donlon Shanks Amber-Rum won a Gold Medal, Best in Category, and Best in Class of any style rum at the American Distilling Institute in 2014. The following year, it was the Dorymen’s Silver Rum that took the prize of Best of Category for un-aged rums in the same competition. CBD continued to win 12 different honors at various competitions and has been named as a Top Five Craft Rum Distilleries by USA Today. Portland Native and America’s first celebrity chef and author James Beard put the Oregon food scene on the map. Today, you can wander that scene by following the North Coast Food Trail – a self-guided tour along the Oregon Coast. We tried numbers 1 through 8 on this map and suggest you do the same. The Trail will take you through some of the most stunning scenery in the world, and punctuate your travels with all things culinary: Famer’s Markets, Cooking Schools, Restaurants, Breweries, Foraging, and much, much more. 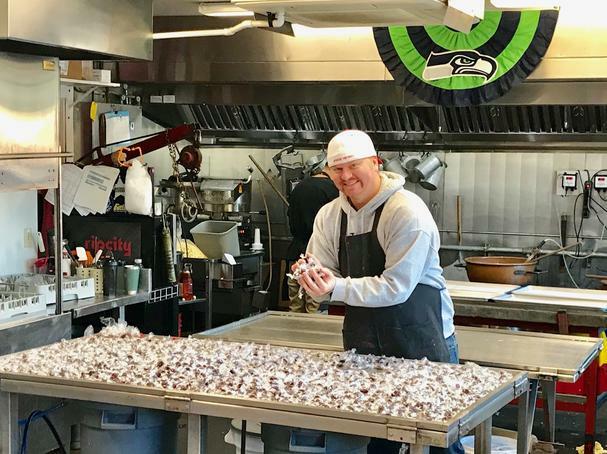 Of course, I believe that all trails should end up with something sweet – so we headed to Bruce’s Candy Kitchen located in downtown Cannon Beach, and easily recognizable by its pink and white striped storefront. Not only do they make salt water taffy, but they also make 16,000 pounds of it yearly! 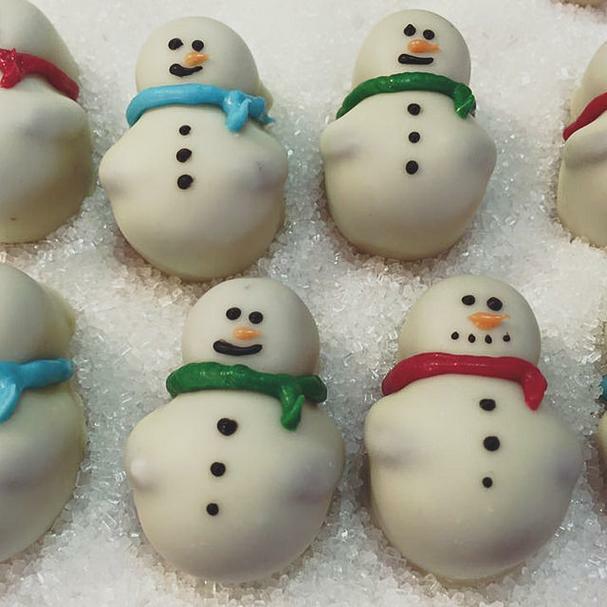 They also create assorted chocolates, brittles, caramels, hard candies, and fudge - all made in-store. A favorite for visitors from Washington State is the Husky Gumballs or Cougar Gumballs. The store was initially owned by Bruce and Treva Haskell when they opened in 1963. Even back then it was a family affair, with both sets of parents, Jack and Cecile Harp and George and Dorothy Haskell helping out with making and selling the candies. It is now a fifth-generation family enterprise. Grandson-in-law, Brian Taylor is currently the production manager and is so “hands-on” that he lives above the store! Kyle, grandson to Bruce also loves his work. So it was time to head home. We always hate to leave, but we reminded each other that 4 hours is really not that long of a drive. We will be back! Editorial disclosure: travel and food were generously provided by Cannon Beach.